Full Price: $ 15.00 10% off! 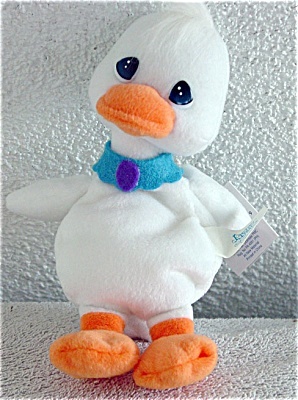 Precious Moments Company Teacher the White Goose Bean Bag Pal plush (originally called 'Beanie Pals') has a blue neck collar. Teacher is from the second (2nd) edition of Pals. She was introduced in 1998, and retired in August, 1999. Teacher has blue and black stick-on tear-drop shaped eyes, and she is 7 to 8 inches in size. New and mint with tag.